The researchers found that, after treatment, the subjects’ pain or discomfort scores in CPSI decreased remarkably, compared to before treatment. Levels of key inflammatory markers were dramatically lower after treatment, too. 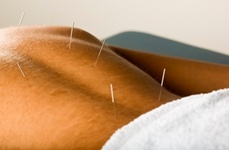 In fact, the overall effectiveness of the acupuncture treatment was rated at 89.4%. This study reinforces the belief that acupuncture can be a safe and effective way to ease pain and relieve inflammatory reactions associated with prostate problems. Of course, the best way to treat the pain of prostate problems is to not have prostate problems at all. The best ways to prevent prostate trouble is through diet by increasing consumption of green leafy vegetables, foods containing high levels of zinc, antioxidants like lycopene, and anything else that keeps your heart healthy. Yuan, S.Y., et al., “Acupuncture for chronic pelvic pain syndromes (CPPS) and its effect on cytokines in prostatic fluid,” Zhongguo Zhen Jiu January 2011; 31(1): 11-4.